Santa Barbara Spa del Mar is a Santa Barbara spa located across from the beautiful East Beach on the Santa Barbara waterfront at the renowned Hilton Santa Barbara Beachfront Resort. Spa del Mar is a great Santa Barbara Day Spa that offers use of the pool and jacuzzi at our five star resort with every spa treatment. 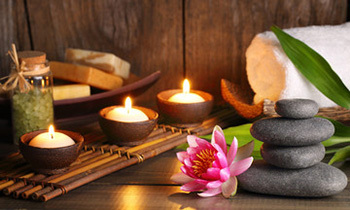 We cater to our resort guests, local clientele, as well as visitors to Santa Barbara who are seeking a unique, and personalized day spa experience. Our talented team of experienced therapists and estheticians offer a variety of customized massages, facials and signature body treatments. Everyone on our team at Santa Barbara Spa del Mar strives to deliver the highest quality of spa treatments. To name a few of many things that sets us apart from other Santa Barbara day spas: we use pure jojoba oil for all of our massages; we hand blend our body treatment products at the time of your service; we offer unique treatments that no other Santa Barbara spa offers; we know what Santa Barbara skincare is all about, and we proudly offer both Yon-Ka and Cell Renewal Systems customized facials. Because we are a small and intimate Santa Barbara day spa, we are able to offer exclusive use of our Santa Barbara day spa for groups of eight or more. This includes use of our beautiful private outdoor patio, as well as pool and jacuzzi privileges at our resort hotel. Santa Barbara Spa Del Mar is the perfect choice for your special day, whether it is a couple’s massage, birthday celebration, bridal/bachelorette party, corporate retreat, or just a day to pamper yourself. Let us make your next spa experience in Santa Barbara unforgettable. Our team will pamper you from head to toe, here at Santa Barbara Spa del Mar across from the beach in Santa Barbara. I've been in the industry for many years and this place is truly great. Attention is paid to every sensory detail. I had the Anti-Stress Back Treatment with a full body massage from Sylvia and it was fabulous! It was a wonderful, intimate day spa experience and I continue to go back again and again. Plus, with a treatment you can use the pool, fitness center, and spa patio for free! Great value for all that you get! Best Santa Barbara spot for a retreat on any day! This is a quiet and elegant spa surrounded by gardens, with an ocean view and, above all, run by truly service-oriented, courteous personnel. Every corner was remarkably clean, charmingly decorated and well kept. No sales pressure for the monthly membership or yearly contracts; no upselling, no stress! I have had an absolutely relaxing time, thank you. This is a quiet and elegant spa surrounded by gardens, with an ocean view and, above all, run by truly service-oriented, courteous personnel. Every corner was remarkably clean, charmingly decorated and well kept. No sales pressure for the monthly membership or yearly contracts; no upselling, no stress! I have had an absolutely relaxing time, thank you. 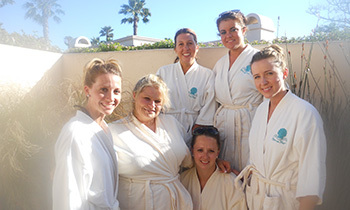 My besties surprised me with a bridal spa day at Santa Barbara Spa Del Mar. We had the whole place to ourselves. The services were excellent and the staff were great... so much fun. So Special. I would highly recommend this spa. I love this spa! I live in Santa Barbara and I don't think there's a prettier venue or better service in town. The staff are polite and professional; the decor is aesthetically very pleasing, and the services they provide will have you coming back for more! Thank you for a wonderful time. Worth every penny!! Spa Del Mar, is one of the BEST in the area. After visiting a few times, the last session was by far the most memorable. My therapist knew exactly how to work with my stressed body, yet keep the service relaxing. The staff is friendly, kind, and welcoming. The pool service is always a plus. Can't say no to a day in SB, ever! Can't wait to return! Spa Del Mar, is one of the BEST in the area. After visiting a few times, the last session was by far the most memorable. My therapist knew exactly how to work with my stressed body, yet keep the service relaxing. The staff is friendly, kind, and welcoming. The pool service is always a plus. Can't say no to a day in SB, ever! Can't wait to return! Spa Del Mar was such a treat. I had the Head to Toe Bliss treatment that was on special from the website. My therapist has been at the spa for over 17 years. She customized my treatment for the special needs I requested. I've been getting massages for over 20 years, she was one of the best! I will definitely go back again. A friend and I came up to Santa Barbara for a girls get-away weekend and stayed at The Fess Parker and had treatments at the Spa Del Mar. We both really enjoyed our treatments - I had a fantastic and relaxing facial and my friend had an all-body massage which she said was one, if not the best, she has ever had! The staff are extremely helpful and even checked the traffic for us since we were heading back to Orange County that afternoon. How nice is that?! I would highly recommend this spa for anyone looking to just chill and be pampered! A friend and I came up to Santa Barbara for a girls get-away weekend and stayed at The Fess Parker and had treatments at the Spa Del Mar. We both really enjoyed our treatments - I had a fantastic and relaxing facial and my friend had an all-body massage which she said was one, if not the best, she has ever had! The staff are extremely helpful and even checked the traffic for us since we were heading back to Orange County that afternoon. How nice is that?! I would highly recommend this spa for anyone looking to just chill and be pampered!